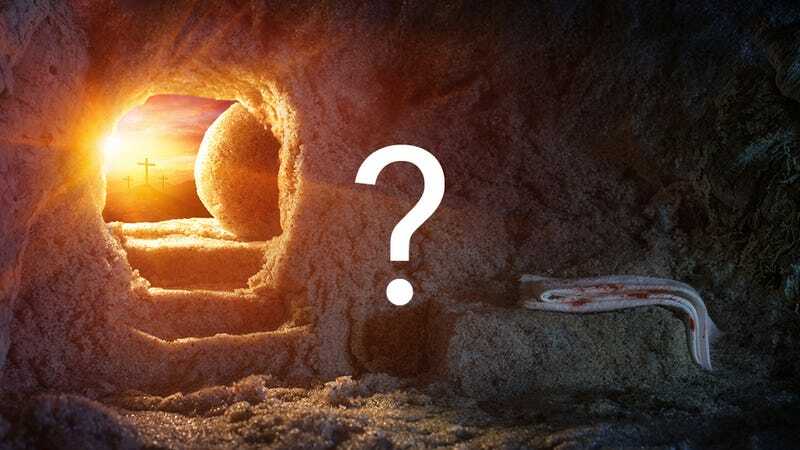 What Time Should We Celebrate Jesus Walking Out of the Tomb This Weekend? As Refinery 29 reports, this Sunday billions of Christians around the world will celebrate the resurrection of Jesus Christ, which famously occurred three days after he died from crucifixion at the hands of Pontius Pilate and his ruthless Roman soldiers. But one question remains: What time is Easter? Though the inspiring story of paternal love and the importance of self-care has been told countless times throughout the years in books like the Christian Bible, films like The Passion of the Christ, and television specials like It’s the Easter Beagle, Charlie Brown, it’s often hard to remember precisely when Jesus opened his eyes, twirled out of those filthy robes, and triumphantly exited that tomb to begin the journey back to his disciples. So! Based on the NOAA’s Solar Calculator (a fun tool I suggest you all fiddle around with sometime), sunrise at Jesus’s tomb (40.4536° N, 141.1481° E) in mid-April, 33AD occurred at roughly 5:19 a.m. local time. What Time Does &apos;What Time Does The Superbowl Start?&apos; Start? Did the Republican National Committee Liken Trump to Jesus in Its Christmas Message?